A 2015 article in the journal Environmental Science and Technology presents additional isotopic evidence that glaucus-winged gulls in the Salish Sea are shifting their diets from marine to terrestrial sources due to human impacts. Scientists hypothesize that declining forage fish may be the cause. Glaucus-winged gull. Image courtesy of USGS. Measurements of naturally occurring stable isotopes in tissues of seabirds and their prey are a powerful tool for investigating long-term changes in marine foodwebs. 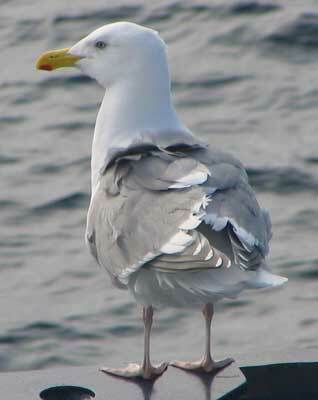 Recent isotopic (δ15N, δ13C) evidence from feathers of Glaucous-winged Gulls (Larus glaucescens) has shown that over the last 150 years, this species shifted from a midtrophic marine diet to one including lower trophic marine prey and/or more terrestrial or freshwater foods. However, long-term isotopic patterns of δ15N and δ13C cannot distinguish between the relative importance of lower trophic-level marine foods and terrestrial sources. We examined 48 feather stable-hydrogen (δ2H) and -sulfur (δ34S) isotope values from this same 150-year feather set and found additional isotopic evidence supporting the hypothesis that gulls shifted to terrestrial and/or freshwater prey. Mean feather δ2H and δ34S values (±SD) declined from the earliest period (1860−1915; n = 12) from −2.5 ± 21.4‰ and 18.9 ± 2.7 ‰, respectively, to −35.5 ± 15.5 ‰ and 14.8 ± 2.4 ‰, respectively, for the period 1980−2009 (n = 12). We estimated a shift of ∼30% increase in dependence on terrestrial/ freshwater sources. These results are consistent with the hypothesis that gulls increased terrestrial food inputs in response to declining forage fish availability. Hobson, K.A., Blight, L.K., Arcese, P. (2015). Human-Induced Long-Term Shifts in Gull Diet from Marine to Terrestrial Sources in North America’s Coastal Pacific: More Evidence from More Isotopes (δ2H, δ34S). Enviornmental Science and Technology. DOI: 10.1021/acs.est.5b02053.